Started cleaning. Cleaned the kitchenette – first layer. Cleaned the road side pressed aluminum to the window. Unscrewed the gaucho, ready for removal. Will get visiting Nathan to help move it out for cleaning it and the wall. Cleaned the door and the buckets under the gaucho. Used “Believe It”. Finished pulling the rug out and made a dump run with the couch cushion, rug remains, and twin bed cushions. It already smells much better in there. Our family’s new addition came to visit. Carol’s new puppy “Baxter”. Tim visited on his way home this AM since we had no Internet or phones at work d/t to the optic fiber catching on fire. He thought she was in good shape and not as big as he had imagined. Thinks she’d be easy to tow with a 4runner. Cay came by after work to give her a look-see in the rain. She was surprised how big she is. Offered to help sew some curtains. Carol and Marc called to say they’d be over this weekend. Carol offered to help measure and prepare for replacing the cushions. Corey’s due home this weekend and mom will probably come up with Wayne and the kids. Leslie wants to go camping in it asap. Ripped up the rug in the front half. Found two major wet spots. The one under the curb side front window is very punk. The leak from under the stove has not caused as much damage yet. Craig helped take out the cushions and I took a pic of my first bag-o-rug trash. Gonna cut out the wood in the cushions and label/save it for a template or reuse. Next up: Rest of the rug, mattresses out, curtains out and a dump run. Bill and Denise Fletcher arrived around 7:30 pm (with chica the chiwowa), a Ford pickup and our new trailer. He pulled her into the driveway (instead of backing in) so the door would be facing the house and we wouldn’t go in and out via the lawn which gets very wet. Earlier in the day, Craig raked up rocks and laid down fabric along the edge of the driveway to keep the trailer over to the east as much as possible. We measured where we thought the curbside tires would be and made a pile of rocks to make it level, which Fletch hit like a bullseye. I can’t stay in her long as she’s musty and stuffy. Hoping to get her cleaned up asap and leave the windows open when the rain stops. On a quiet Sunday night, I sat in the dark refreshing my browser over and over again. 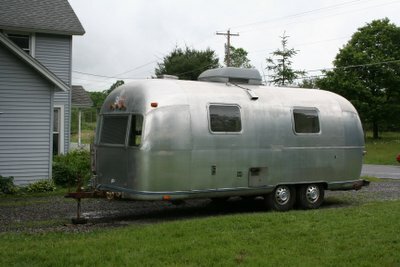 I put in my top bid on a 1973 23′ Safari Airstream on eBay in the last 10 minutes of the bidding. I tried to wait longer, but couldn’t. With 30 seconds left, someone went $50 over my high bid. Gosh darn it all. Ok, just one bid higher, 23 seconds …. refresh …. refresh ….. refresh ….. “You have won this auction!” Yeah, she’s mine, all mine! I’m still running on adrenaline, cuz I didn’t get any sleep last night. Before I bid, I visited the trailer on Saturday up between Cayuga and Seneca Lakes at Fletcher’s Trailer Sales on Rt 227. A pristine workshop with organized vintage trailers and buses lined up and some hiding behind trees. Fletch works on all kinds of trailers and is a great guy. He and Denise live in a log cabin built by his parents in the 1940’s. They are and have a great country treasure. The trailer is not in good condition internally and Fletch made no bones about whether any of the utilities worked. Externally, she looks pretty good. A broken curb-side front corner window and a concerning hole in the belly pan, but mostly intact. Fletch kindly offered to deliver the trailer since we don’t have a tow vehicle yet. What a guy! It’s coming next week sometime.